All of our Registered Pharmacists are board certified to administer vaccines to adults over the age of 18. We have successfully vaccinated thousands of patients. 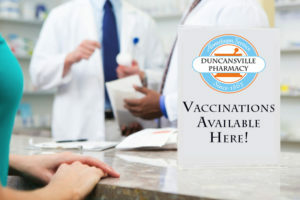 No appointments are necessary to receive a vaccination at Duncansville Pharmacy! Simply walk in and let us know what you need. Be sure to bring your insurance or Medicare card with you for all immunizations. Click on a vaccination below to expand for more information. Influenza is a highly contagious disease. The virus of the flu “bug” can spread quickly and be extremely dangerous, especially to those with heart or lung problems. You don’t need a prescription to get this important vaccine, and it is covered entirely by Medicare. All adults over age 65 should receive this vaccine to prevent the serious pneumonia infection. This disease is becoming more resistant to some drugs and is therefore more difficult to treat than in the past. Available without a prescription and covered entirely by Medicare, getting this vaccination simply makes sense. 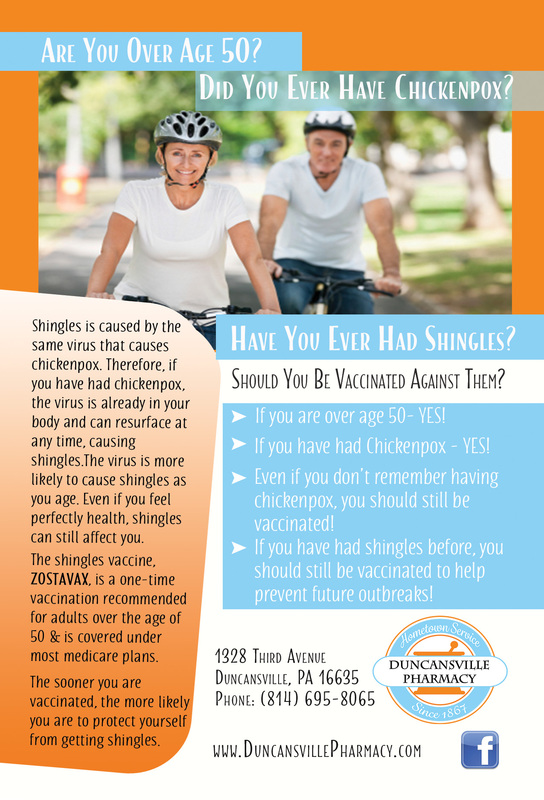 This relatively new vaccine (Zostavax) is designed to prevent Shingles—a painful, life-changing disease. In addition, it is not covered under your regular Medicare card, but it is partially covered by your Medicate Part D prescription plan.